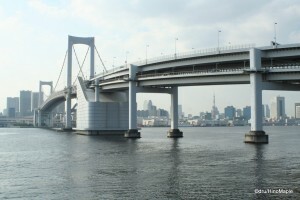 Rainbow Bridge is one of the most famous, if not the most famous bridge in Tokyo. It has been used as a backdrop along with Tokyo Tower to define Tokyo. It is a famous backdrop in the summer for the Tokyo Bay Fireworks festival as well as one of the easiest ways to access Odaiba. The bridge itself is 798 metres long with a main span of 580 metres. It is a main artery that has been painted white. At night, the bridge is often lit up in various colours. It is often lit in a rainbow of colours to highlight the bridge’s popular name, but it has been lit up for other special occasions such as pink for breast cancer awareness or other similar events. While the official name of Rainbow Bridge is quite boring, city officials took the nickname, Rainbow Bridge, and ran with it. On most nights, the bridge is lit up naturally so that the the white paint stands out against the traditional backdrop of black and grey buildings. 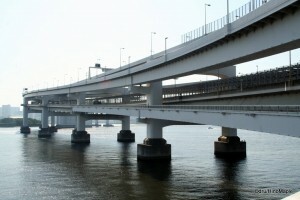 As with any bridge, there are only two ways to access the bridge itself, the Odaiba and the Shibaura side. I would recommend the Shibaura side as there is an elevator to access the promenade which makes the walk a lot easier. On the Shibaura side, you can access Rainbow Bridge from either Shibaurafuto Station on the Yurikamome Line or Tamachi and Mita Stations on the JR and Toei lines. From Tamachi and Mita, it is a bit of a walk to Rainbow Bridge but it is a nice relaxing walk through some new residential areas. The area around the bridge itself is not special. It is a port area with nothing more than large trucks driving everywhere. It can be a little dangerous at times to cross the street as trucks speed through the area. It isn’t too bad as traffic isn’t too heavy and there are large gaps between cars. Upon entry to the main anchor on the Shibaura side, you will be treated to a more touristy setting. While there are no people to give you information on the bridge itself, there is a small display and information signs telling you where to go. The elevator is not very quick journey as the main deck is located 7 stories up. The bridge deck has two promenades. There is the north and south side but you must make your decision before you head up from the bottom of the Shibaura anchor. I ventured on the south where all the traffic was heading towards Shibaura. The views on this side were nice but probably better on the north side. You can get a view of Kawasaki and Odaiba from the south, and views of Tokyo Tower and central Tokyo from the north. On the south side, it can get a bit boring as all you see are container ships and the sparsely populated Odaiba region but the photos can be amazing. The first thing you will notice will be the wind. The second you walk outside the anchor you are hit by the wind. If you have ever walked across a bridge you will know what I’m talking about. Most bridges over a body of water are subject to higher winds. It was a bit daunting on the day that I visited Rainbow Bridge. It was a constant barrage of wind that kept me from walking smoothly. The second thing you will notice is the vibrations. Being a double decked bridge with 8 lanes of traffic and a rapid transit line, it is hard to walk along the bridge without feeling the constant rumble of cars. If you are in a car at the time you won’t notice it as much as the car’s suspension does a good job at creating a smooth ride, but when you walk along the bridge, you will get a mild sensation that a small earthquake is occurring. The first tower is fairly close to the Shibaura anchor. Each tower forces the promenade to go on the outside of the tower itself. This provides a better view of the surrounding area. Unfortunately, there is a fence that runs the entire span of the bridge. Thankfully they cut holes into a fence around the towers so you can take photos. At all other points along the bridge you have to take photos through the safety fence. The fence serves two purposes. 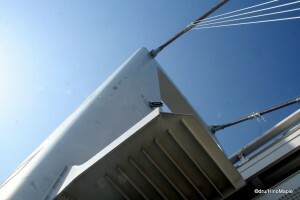 One is to keep people from being blown off the bridge itself, and the other is to prevent suicides. In Japan, that is understandable. The midpoint of the bridge is not spectacular but there are signs to inform you that you are at the midpoint. 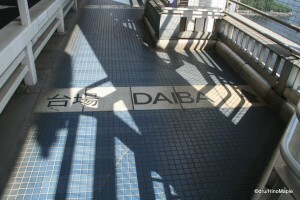 There are signs on the floor that tell you which direction you need to go to reach either Odaiba or Shibaura. There is also an information sign on the wall to inform you exacatly where you are. It is an interesting place as it is a small section that is neither Odaiba nor Shibaura. You are in a “no man’s land” between cities. Other than that, it is no different than any other section of the bridge. It is noisy, windy, and shaky. From that point on, things are relatively easy. The Odaiba tower is almost a mirror of the tower on the Shibaura side. The anchor on the Odaiba side has an elevator but you cannot use it. The anchor on the Odaiba side is for maintenance workers only as the anchor is on an island. There is no access to the main island from the Odaiba anchor. The approach to the Odaiba tower from Odaiba is a long gradual slope. There are no fences so the view is spectacular. You can enjoy the view of the batteries that used to protect Tokyo from invaders and you can get good pictures of Odaiba as well. 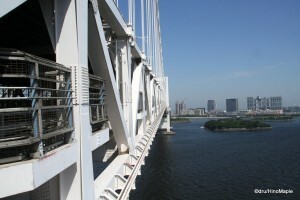 It is also popular for tour groups to take a short walk to get a better view of Odaiba. For many people, walking out to the bridge tower itself is easy but walking all the way across isn’t. 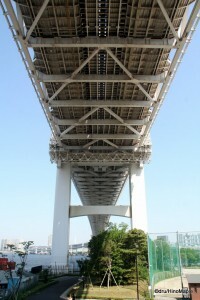 Most people will start on the Odaiba side and head to the first tower before returning. In reality, that is more than enough but for perfectionists, walking along the entire bridge deck on both the north and south side is a must. Rainbow Bridge is often a tourist attraction that is to be seen, not experienced. It is not a common place to be for anyone as most people wouldn’t think twice about visiting any bridge. In Japan where domestic tourism is very high, they do whatever they can to lure tourists to various locations. Food is the most popular way to lure tourists to various regions, but the bridges are what connect these places. The government knows this and they created creative ways to highlight their bridges to encourage more tourism to these areas. One great example is the Onaruto bridge. The Senjojiki Observatory is located under the main deck and provides great views of the sea below. While most people will skip this, it is still a popular destination for domestic travellers. Rainbow Bridge is not as spectacular, and honestly not worth the time for most people, but it is a great way to spend a morning when most of the shops are closed in the area. This entry was posted in Tokyo and tagged bridge, Daiba, japan, Kanto, Kawasaki, Mita, Mita Station, Odaiba, Rainbow, Rainbow Bridge, Shibaura, Suspension Bridge, Tamachi, tokyo, Tokyo Bay, Tokyo Bay Fireworks, Tokyo-to by Dru. Bookmark the permalink.